In the Deccan, by the period of the early Chalukyas, the Indian temple was fully developed. 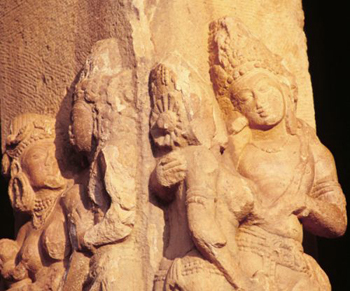 A MOST fascinating study in ancient Indian history is that of the patronage of stupas, temples and the art in them. In the 3rd century B.C., Emperor Asoka erected inscribed pillars with sculpted capitals and made other rock edicts. This was in keeping with the contemporaneous traditions of the Persians, with whom he had considerable contact. In the 1st and 2nd centuries A.D., the Kushanas, who hailed from southern China, patronised royal temples at their winter and summer capitals and even had portrait sculptures made of themselves. Such depictions were entirely out of keeping with Indic traditions and did not last beyond the period of their rule. Apart from the exceptions mentioned above, none of the art of ancient India, in its vast quantity and geographical spread, was directly patronised by kings. In fact, it may be noted that even Asoka, who personally followed the path of the Buddha, patronised the caves made for the Ajivikas, a deeply ascetic sect. In his inscriptions, the emperor does not mention the Buddha or any specific Buddhist philosophy or text. In keeping with Indic traditions, he speaks of dharma, which is common to all Indic spiritual paths. In fact, he says in his Minor Rock Edict XII: “His sacred and Gracious Majesty the King does reverence to men of all sects…. A man must not do reverence to his own sect or disparage that of another man, without reason. …The sects of other people all deserve reverence…. Bahubali, Jaina cave, Badami, 6th century. In keeping with ancient Indic traditions, caves of different faiths were made at the same site. The Jaina saint Gomatesvara, or Bahubali, is believed to have meditated in a standing, still posture for so long that creepers grew about his legs and snakes and other creatures gathered around him. The play of light in the magnificent rock-cut cave enhances the experience of the sacred interior. 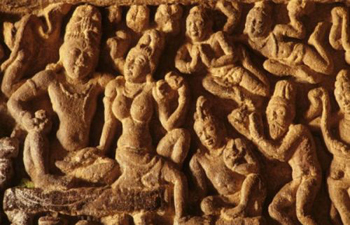 The period of the Kushanas, who personally worshipped Brahmanical deities, saw the making of a profusion of Buddhist art. Inscriptions clearly show that all the art of the stupa railings and caves of the early period in India was the contribution of common people, monks and nuns. The inscriptions also show that rulers patronised monuments of all faiths through grant of revenues for villages and through other means. However, they did not make such edifices directly dedicated to any faith. By the 3rd and 4th centuries A.D., at Nagarjunakonda, queens had begun actively to patronise Buddhist sites even while their husbands worshipped Brahmanical deities. At Ajanta, by the 5th and 6th centuries, it had become common for ministers of the king, feudatories and members of the royal family to patronise such art and monuments. Still, until this period there was no inscription that directly attributed the making of temples or caves and their art to a ruler. In the subsequent art of the Chalukyas, of the 6th to the 8th centuries, there was a continuation of such traditions. Magnificent caves and temples were made and dedicated by members of the royal family. However, there was none made by kings. This is a phenomenon unique to ancient Indian art and history and needs to have more attention focussed upon it. Such a study would throw light not only on the cosmopolitan nature of early Indic society but also on the attitudes of early Indian rulers and on the codes of conduct and kingship that they were to follow according to ancient scriptures. Chitrasutra, the ancient Indian treatise on sculpture and painting, states that the purpose of art is to show one the grace that underlies all of creation, to help one on the path towards reintegration with the divine. From the 4th century onwards, the human form became the main embodiment of philosophic concepts. Exquisite forms were made to move one and to transport one beyond worldly concerns to that which was more important. Temples were conceived as homes for the deity, where the formless eternal took on a shape to give darshan to the devotee. Darshan is the acquiring of grace that occurs when one looks upon the beauty and harmony of the divine. 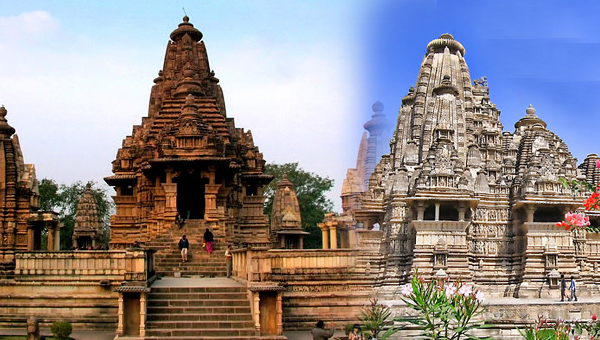 Many structural temples were made in the Gupta period, from the 4th to the 6th centuries A.D. However, most of them were made of brick and have not survived. The earliest large body of well-preserved temples is of the period of the early Chalukyas, from the 6th to the 8th centuries. These were made near the banks of the Malaprabha river, in present-day Karnataka, and on the Tungabhadra in Andhra Pradesh. Siva and Parvati, sculpted pillar, interior of the Virupaksha temple. The temple is richly adorned with sculpture, both on the exterior and in its interior spaces. It is a world populated by the images of divinity. 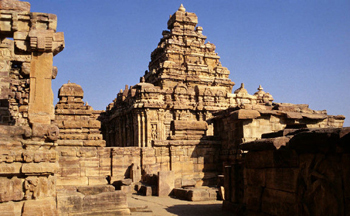 The Chalukyas rose to power in the mid-6th century and made their capital at Badami, in present-day Karnataka. 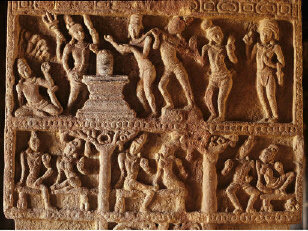 The earliest monument of their rule is the Ravana Phadi Cave at Aihole, not far from Badami. It was probably made around A.D. 550 and is dedicated to Siva. 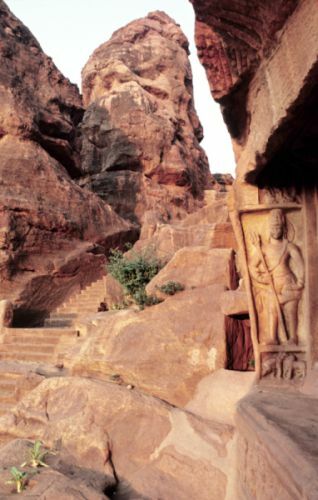 The red sandstone cliffs of Badami offered a spectacular setting for the excavation of four caves, three Brahmanical and one Jaina. The largest and most impressive of these is Cave 3, dedicated to Vishnu. An inscription next to a Varaha depiction states that the cave was dedicated in A.D. 578 by Mangalesa, a brother of King Kirtivarman. Many Chalukyan monuments were patronised by members of the royal family. Saivite theme sculpted on an interior pillar of the Virupaksha temple. The light from distant doorways and windows creates a marvellous effect in the dim interiors. A panel of ganas can be seen across the basement in front of the cave. Stepping inside the cave, one is transported to another world. Large figures of the forms of Vishnu can be seen on panels along the walls. 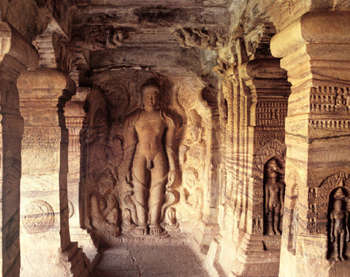 There is a continuation of the sculptural styles of the rock-cut caves of the western Deccan. However, the figures have become more slender. There is the elegance of the post-Gupta period and a distinct Chalukyan style is seen. A fine portrayal is that of Vishnu seated in a posture of royal ease on the cosmic serpent Ananta, which means endless. Vishnu is also depicted in the Narasimha avatara, part human and part lion, which depicts the majestic courage that lies within us. The Varaha avatara of Vishnu, which represents the great power of true knowledge, was the favourite representation in this period. In this form, Vishnu comes as a boar to rescue the Earth goddess from being submerged in the ocean. In this period, many deities in Indic art began to present the heroic and glorious qualities that are to be found within us. Dhvaja Bearer, Nandi "mandapa", Virupaksha temple. The gentleness and grace of ancient Indic sculpture continues in the more slender forms of Pattadakal. The pillars of the mandapa are elaborately carved with kirtimukhas and other motifs. Mithunas, or loving couples, represent the creative forces and the harmony of the natural order. The cave has surviving fragments of 6th century paintings, which are extremely valuable as a record of the art of that time. It is known that the walls and ceilings of most early Indian monuments would have been fully painted. Elaborately carved ceiling panels are a distinctive feature of the caves and temples of this period. The architecture and sculpture of the caves are inseparable from each other. The carved figures, the motifs and the magnificently excavated cave interiors are parts of an integrated whole. Cave 1 is dedicated to Siva and is also of the mid-6th century. Projections of the rock face, at right angles to the front of the cave, continue the sculptural programme. To the right of the entrance is a magnificent depiction of the Nataraja, Siva in the cosmic dance. In the Nataraja here, one can see the movement and the multiplicity of the world of creation, yet all are held together in the great harmony of the natural order. The grace of the figure continues the styles that were established in the preceding century, in the Gupta period. The region of the Malaprabha river in the Deccan was a meeting place of the styles of temple building that were developing in northern and southern India. While temples of other regions have been lost, examples are preserved here because little or no building took place in later times. Aihole is today a small village in a remote part of Karnataka. Many of the temples here were used until recently as houses or cattle sheds and are known by the names of their former owners. For instance, at the temple of Lad Khan, which was probably built around the end of the 6th century, an inscription states that it was dedicated to Durga. It has a large porch with fine figures carved on the pillars. Within is a simple, square hall in which the windows create a striking effect. A Nandi, the bull on which Siva rides, is a later addition. A small second storey, with sculptures of Siva and Vishnu, is part of the original conception. 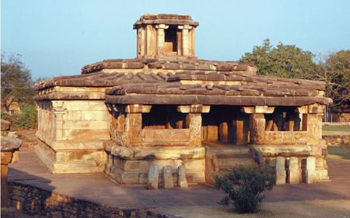 A wide range of architectural styles can be seen at Aihole. The Durga temple, most probably of the early 8th century, is apsidal in form. Apsidal temples usually have barrel roofs. However, this structure is unique in combining the apsidal shape with a small northern-style shikhara (tower), which rises above the sanctum. The northern-style (Nagara) shikhara is shaped like a beehive and is made up of layer upon layer of architectural elements called kapotas and gavakshas. The temple also has a very unusual, open ambulatory around the sanctum, with pillars and no wall on the outside. The niches on the inner wall of the ambulatory have some of the finest sculptures of Chalukyan art. There are splendid images of Siva and Durga here. The quality of naturalism is striking. Each of the arms of the figures is placed just as an actual arm would be placed in relation to the body. In the art of this period, the emphasis is on relatively fewer, but major, images made in niches. These are isolated from others and are not shown in crowded groupings. The northern-style of the shikhara and the treatment of the sculpture suggest an affinity to the temples of Alampur, which were made around the same time. Parts of present-day Andhra Pradesh were under the control of the Chalukyas in the 7th century. Alampur has nine temples, which are called Navabrahma temples in a later 16th century inscription. These were made at the end of the 7th century or in the early 8th century. Eight of these are built in the Nagara style. The Alampur temples are among the finest of the Chalukyan period, and the most beautiful of them is the Svarga Brahma, constructed at the end of the 7th century by a queen’s son in her honour. The exterior walls of the temple have latticed windows and niches containing deeply cut figures. The central niche has an image of the deity who is to be represented in that direction. There are finely made mithunas on either side. They display the soft modelling and beauty of form that continued from the Gupta to the post-Gupta period. The temples of Pattadakal are on the Malaprabha river, a few kilometres from Aihole. These mark the return of Chalukyan period temple patronage to Karnataka after several years of activity in the Andhra Pradesh region. The first great temple here is the Galagnatha, which is in the northern style and is similar to the Alampur temples. Chauri bearer, Navabrahma temple group, Alampur, Andhra Pradesh, end 7th/early 8th century. This figure, caught in graceful movement, presents the fine qualities of the Chalukyan-period style. There is a full-bodied roundness of the figure, a gentle expression and liveliness. It is in the Virupaksha temple that the full glory of art under the early Chalukyas can be encountered. The Virupaksha temple was built in A.D. 735 by a queen of King Vikramaditya II to celebrate his victory over the Pallavas of Kanchipuram. It was probably modelled after the Kailasanatha temple at Kanchipuram, which had greatly impressed the king. The Virupaksha temple would also have served as the model for the Kailasanatha temple built at Ellora under the Rashtrakutas, who succeeded the Chalukyas. The Virupaksha temple is the largest of this period. Its compound walls enclose a complex of 30 sub-shrines in the courtyard and a large Nandi mandapa. There is a pavilion housing a Nandi in front of the temple. This was to become a continuing tradition in Siva temples. The Virupaksha and the Kailasanatha at Kanchipuram were probably the largest and most ornate temples in India at that time. The structures of the Virupaksha temple are all made of the local red sandstone and are elaborately carved. The outer walls of the temple have 35 niches, with images of Siva. 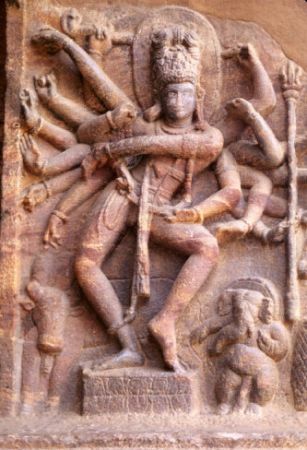 Sculpted Pillar, Durga temple, Aihole, 8th century. There is a quality of gentle movement and grace that defines the sculpture of this period in Karnataka. The fine expressions and warmth of earlier art is combined with a new sense of movement. Eighteen pierced windows serve to light the vast interior hall. The hall has four rows of pillars, which divide the space into aisles. The interior of the Virupaksha temple presents a world of sumptuous carvings. Scenes from the epics are carved on the pillars. There are many figures in dynamic compositions. The work is miniaturised but extremely detailed. With light filtering in from the pierced windows and the distant doorway, the effect is dramatic. The deities made on the temple walls are finely sculpted with full and rounded forms. The figures follow the proportions and movement of human beings. Yet, the purpose of this art is not to present them as mere humans. It is to take the human form and to fill it with divine beauty and grace, to remind us of the divinity within us. The sanctum enshrines the Siva Linga, made of black stone. Mithunas are auspiciously placed in the temple and the porches. They remind one of the fruitfulness and harmony of nature. A shrine next to the sanctum has an image of Durga, as Mahishasuramardini, slaying the buffalo demon. There is a great naturalism in the nimble Durga, who stabs the Mahisha, whose only buffalo feature is his horns. Even in the midst of the drama of the moment, there is a marvellous sense of detachment, as she looks away from the demon and not at him. The Mahisha is on his knees, in a pose that conveys reverence as much as it does defeat. Apsidal Durga temple. The apsidal form was very popular in early Buddhist rock-cut "chaityas" and was replicated in some later temples. This is an unusual instance when the apsidal form is combined with a "shikhara". 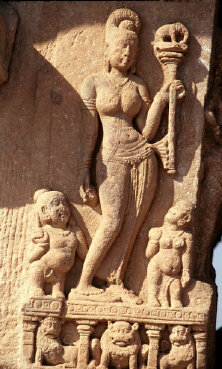 Many of the sculptural figures at Pattadakal are dynamically posed. This vitality and movement is seen in the 8th century in temple art in many parts of India, including Tamil Nadu, Rajasthan and Orissa. The dvarapalas seen at Pattadakal have a remarkable similarity to those of early Chola temples, built 150 years later. One of the miracles of Indic art is how the deities are shown in the midst of dynamic action and yet are sublimely peaceful. This is conveyed by the manner in which the faces are treated. The look is within, beyond lowered eyelids. The Mallikarjuna temple was made by Trilokamahadevi, also a queen and the sister of Lokamahadevi who built the Virupaksha temple. It is also made in the Dravida style of South India. 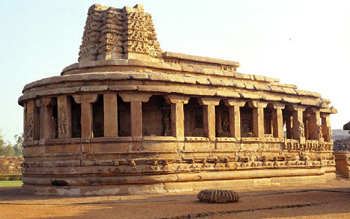 It is similar to the Virupaksha temple, though smaller and not very well preserved. The Lad Khan temple. This temple, dedicated to Durga, has a most unusual roof. In imitation of contemporaneous wooden structures, logs of wood were replicated in stone. 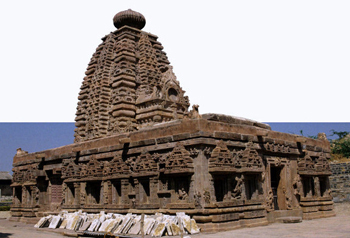 Of the four temples at Pattadakal with Nagara shikharas, the largest is the Papanatha. It was probably made after the Virupaksha temple, in the early 8th century. The richly decorated interiors continue the traditions of the Deccan. Further south, in Tamil Nadu, temple interiors remained starkly unadorned until a much later date. Ceiling panels are one of the distinctive and among the most beautiful features of early Chalukyan temples. There is a Nataraja on the ceiling of the Mallikarjuna temple. A fine Siva depiction can be seen on the ceiling of the mandapa of the Papanatha temple. This feature was taken up in the later temples of Rajasthan and Orissa. Divine couple, Sculpted pillar, Lad Khan temple, Aihole, 6th century. The harmony of the natural order is conveyed in Indic art in the mutual affection of divine couples. In the Deccan, by the period of the early Chalukyas, the Indian temple was fully developed. On its outer walls and in the sacred interior were depictions of great beauty and grace. 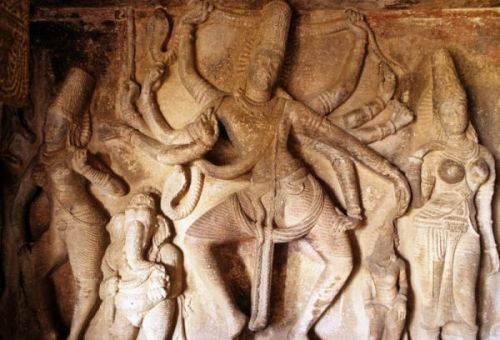 Nataraja, Ravana Phadi cave, Aihole, 6th century. This exquisite image combines the dynamic movement of the dancing deity with great elegance.